Jamie Squire/Getty ImagesSergio Garcia likely won’t make the cut at the Masters this weekend, but as the reigning champion, he’ll still have to stay at Augusta National for a few days. Even though he’s out of the tournament, Garcia will still have to hang out at Augusta for the next two days, due to the tradition of the Masters. The reigning champion at Augusta National had a reasonably normal round going, sitting at +2 on the day after 14 holes – not playing the best golf on the course, but just a few strokes out of contention. 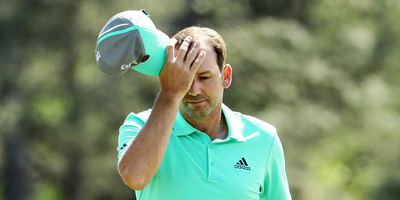 Then, disaster struck on the 15th hole at Augusta National, when Garcia took a page out of “Tin Cup” and hit five straight balls into the water. You can watch four of those five misses below. Garcia would eventually take 13 strokes to finish the hole, tying a Masters record – and not the good kind. The nightmare hole meant that Garcia would need a miracle round on Friday to make the cut and play through the weekend. While his second round hasn’t had as bad a meltdown as his Thursday, he hasn’t scored the birdies he’d need to make the cut and would be heading home tomorrow if this were any other tournament. It may be a bit awkward, but it’s not unheard of – last year, reigning champion Danny Willet had to hang out a few extra days at Augusta National before handing the green jacket off to Garcia.